In the summer of 2006, we spend a weekend in Albany, NY, our capital city. 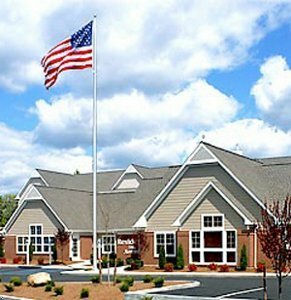 My husband did not want to stay in a cheesy motel, so he chose the Marriott Residence Inn near the airport, in Latham, NY. He was willing to pay the expense of staying at such a luxurious hotel (in my estimation), so how could I refuse? lol. Latham, NY, is a few miles north of Albany. The Residence Inn is tucked in a cul-de-sac of the typical business park setting: narrow roads with other hotels, a few convenience stores, and a gas station or two. I don’t like the concrete-jungle look of the business parks (New York State is calling them “Empire Zones” because the businesses that settle in such zones get tax breaks) but have learned to accept it in Upstate NY. We pulled into a entrance narrow road of circular roadways. There are about 100 separate suites at this Marriott. The Residence Inn is not like a hotel, it’s more like a collection of apartments, or townhouses. They are usually occupied by longer-term vacationers or business people. The Inn had a pool, a fitness area, and a heated spa. Too luxurious for us! We just wanted a clean place to stay that was private, and where all six of us could be together. See, this is the hardest part of traveling overnight with a larger than usual family. 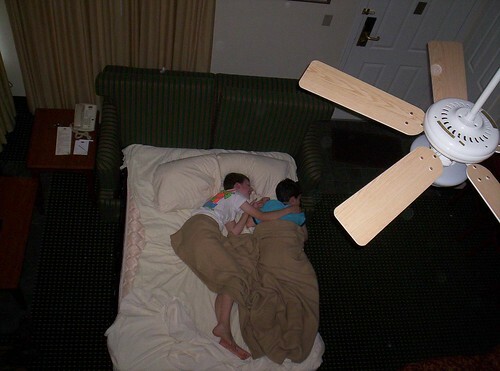 Most hotels have occupancy rules, and will not allow more than four people to stay together in a room. We do not like being split up. Therefore, finding a hotel to accommodate our large group can be an arduous task. This is why we decided on the Residence Inn. The suites are geared for families. They are non-smoking and very private. Check-out was quick and easy, however front desk service could have been more mannerly (get off the phone with your girlfriend and please give me my keys to my room). I don’t know what it is with front-desk service, is it really so hard to attend to the guests? Unfortunately, I am now conditioned to be surprised if I get a representative who is attentive and friendly. Grr. We found our suite after driving around a little. As with our stay at the Lodge on the Green, the building was two-story and required a little hike up the stairs. My kids are very good about carrying their luggage (and mine) so we managed that very well. The suite was a “two storey” suite and very, very nice. Downstairs was a little entrance area, and a living room, bathroom, small kitchen, and large bedroom (sliding doors closed off the bedroom). Upstairs was another bedroom and a bathroom. The beds were evenly divided for us: 2 upstairs, 2 in the downstairs bedroom, and two on the sofa sleeper in the living room. Perfect for us. 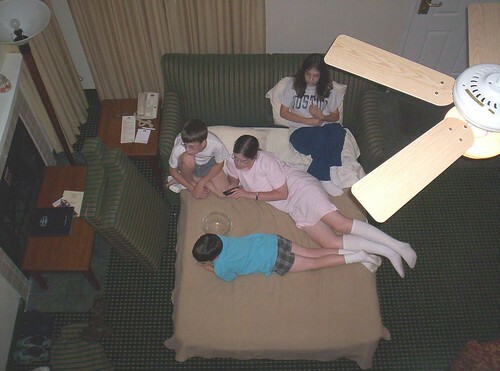 I snapped a few photos of the kids, looking down from the upstairs bedroom. The upstairs bedroom has a half-wall, like a loft, which gives it an airy effect and also allowed me to monitor the downstairs activities. The room was extremely clean. The non-smoking atmosphere helped, too. There were a few things in the kitchen: coffee, tea, and a few snacky things. Because we were only staying one night, we didn’t settle in too much. The beds were very comfortable. Sleeping was hard for the kids, though. This was partially due to the excitement of being away from home, the anxiety of being away from home, and the airplanes that flew overhead. The noise of the planes wasn’t too bothersome, but one of the children is a very light sleeper, and she did not enjoy her stay because of this. Wireless access is available at the Inn, as it is in most places now. I couldn’t connect, however, not knowing how ethernet worked at that time. I usually bring my laptop when we travel to connect to the Internet and upload photos and check business email. The woman at the tech help service desk was extremely friendly and even called me back later to ask how I was progressing. I couldn’t connect, and to this day I’m still not sure if it was my laptop’s configuration settings or the service. At any rate, I’d brought my laptop for nothing and couldn’t check my mail. Breakfast was crowded. Summer in New York’s capital city district is probably a very busy time, but the dining area seemed unusually small and a little uncomfortable. Of course, we could have eaten breakfast in our suite, but we wanted to leave early and also who could resist their offer of free food in the dining area? The food was OK, with a wide variety: scrambled eggs, pancakes, waffles, a variety of juices, etc. The kids enjoyed their meal (not unusual, lol). Check out was very quick and easy. I’d go to the Residence Inn again, but only if I won a million dollars or something. It was too expensive for comfort, even if it was a “vacation.” The room was the most impressive of all to me. It was clean, it was comfortable, and it was relaxing. I’m sorry my daughter was disturbed by the airplanes! Overall, our stay was pleasant. Now THAT is the best hotel I have ever slept in! I liked that balcony for the upstairs. And I was NOT pillow fighting! Beetle Bailey was trying to PUSH ME OFF THE BED!!!!!! !